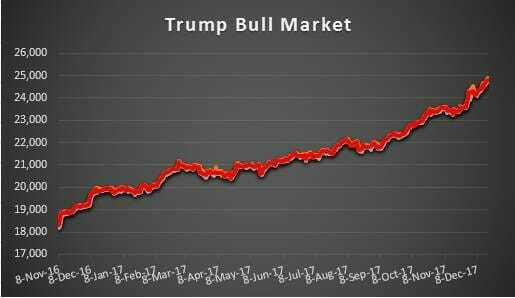 It's Official: Trump Now Has Greatest Stock Market Rally in History! Dow Breaks 70th New All-Time High in '17 - Most Ever in One Year! It’s Official: Trump Now Has Greatest Stock Market Rally in History! Dow Breaks 70th New All-Time High in ’17 – Most Ever in One Year! The Dow ended up again today at another all-time high for the 70th time this year – breaking the record for the most all-time highs in a calendar year set in 1995. * President Trump’s stock market rally is historical! No President has seen more all time highs (70) in their first year in office than President Trump. No one has seen more all-time highs in a year ever.